India Fest widens its reach! India Fest is an annual celebration of Indian culture, put on by the India Association of Memphis, for the entire community to experience Indian cultures & traditions. In its 14th year (2016), the organizers of this festival engaged Sauce in the task of attracting new attendees with a special emphasis on educating and attracting a non-Indian audience. 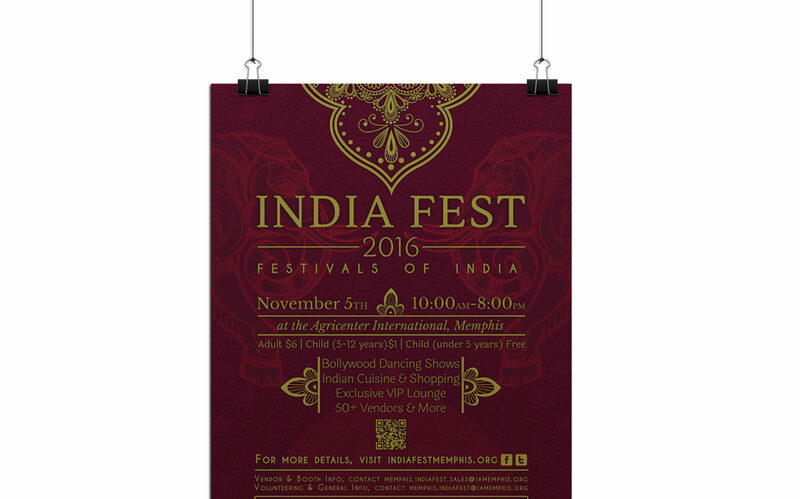 They asked for this because in the previous 13 years, they intended the festival to be an event where all cultures could come together to celebrate Indian culture, but their marketing efforts were mostly attracting their fellow Memphis-area Indians. IndiaFest gets a new logo & promotional items including social media ads. The new branding creates a buzz by appealing to a wider audience. In an effort to reach the intended segment of the target audience, Sauce designed a digital billboard and consulted on locations for display to maximize exposure. Additionally, Sauce designed a promotional poster that matched the style of the billboard for brand consistency. This poster was distributed to India Association of Memphis members for posting at various community locations. Sauce organized a strategy for reaching a wider audience that included non-Indian segments of the population. Most of this year’s work was put into creating higher quality assets that were ultimately more engaging and better at converting the audience we sought to win. Included in the social media assets were 10 post designs & a video with voice-over, created using photos and footage taken by members of the India Association of Memphis. Team Sauce attended also India Fest and captured video and still photos of the event, including mayor Jim Strickland’s presence at the unveiling of the DIYA Forever Stamp. We then created a video press release and submitted it to local news stations the same day as the event.